Of course, we Goans must have coconuts in our fridge all the time as it comes handy in most of our dishes. In Goa, coconut is used to give the local flavour to our cuisine. And I love the flavour, it imparts. Goan sweets cannot be made without coconut. Coconut milk and grated coconut, in fact coconut, in some form or the other, is used in sweets like Bebinca, Bolinhas, Pinac, Dodol, Baath, Alle Belle, etc. I love the neutral, slightly sweet taste of coconut. Perhaps that is why it integrates so well in desserts. Recently had a delicious Alle Belle at The Leela Mumbai. The coconut and jaggery filling was perfect. Neither ingredient was overpowering the other. I also love coconut in sweets like ladoos and barfi too. Of course in Goan sweets coconut milk is made use of often, but somehow, I prefer the desiccated version. 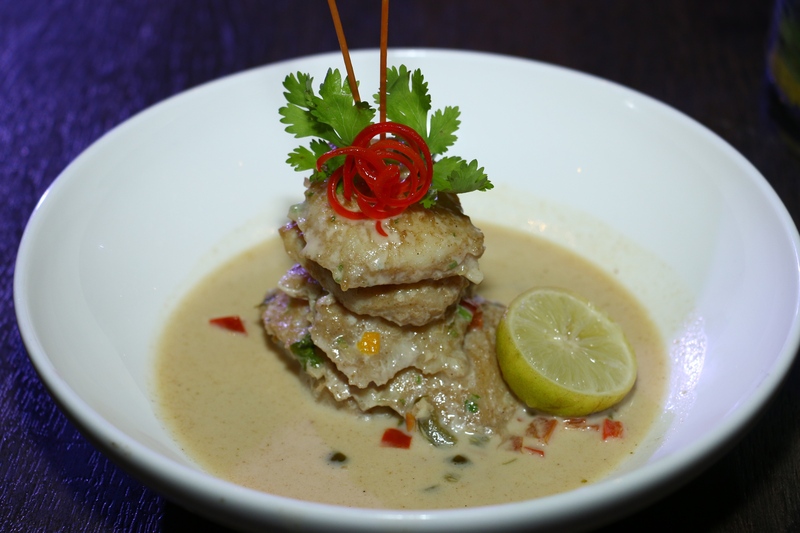 The texture of the coconut milk or cream does not appeal to my palate, except in savoury dishes like the Goa orange curry or even a Thai red or green curry. Interestingly, the use of coconut for desserts is not limited to Indian cuisine only. Thai cuisine uses a lot of coconut milk in their desserts too. One of my favourites is ruam mitr. I first tasted it in Bangkok. It contains jackfruit, green noodles, palm kernels, corn, and water chestnuts in a red covering, in a very light coconut milk with crushed ice. It is refreshing and perfect for summer. And it is not very sweet. Another popular one is Khao niew bing. This too is not overpoweringly sweet, but the undertones of coconut and fruit along with smoky hints from the grilled banana leaf make it irresistible. Coconut in any dessert is fine as it is fairly common in global desserts too, but I cannot handle coconut ice cream at all. Not the tender coconut one at Natural’s too, although people rave about it. But I can never resist coconut macroons. Some Goa bakeries make great ones. Even Pune for that matter. Crème brulee with coconut is quite innovative as well. And now I am off to grate coconut for my Goan dessert! Maybe some godshem? I was lucky to have attended the All You Need Is Ecuador Press Conference yesterday. Oh! It was such a revelation. Ecuador is such a beauty. A unique place with universal appeal. The 8th most bio diverse country in the world. Whew! Pro Ecuador, the Institute for the Promotion of Trade and Investment of the country, were such gracious hosts. Consul General of Ecuador, Mumbai, Hector Cueva Jacome and Priscila Moscoso Meiller, Trade Officer were warm and ever willing to share information. The cuisine sounded even more interesting. To a gourmand like me, the food has to be tempting. And it sounded extremely appetizing and varied. Most regions in Ecuador follow the traditional three course meal of soup, a course that includes rice and a protein, and then dessert and coffee to finish. Supper is usually lighter and sometimes consists only of coffee or herbal tea with bread. Wow! Sounded just like what I would enjoy. They also eat a lot of fish, shrimps and tuna in particular. Perfect, I thought. We sampled Empanadas De Viento – A combination of the gooey cheese and onions inside a crispy fried empanada and topped with sugar. I relished them immensely, but could not help note the similarity between these and our own Rissois from Goa. These were definitely strongly reminiscent of Rissois. Those too are little envelopes, usually filled with prawns, onions and white sauce and deep fried. Of course there is no sugar on those. But there is no cause to be startled at the similarity, I thought. After all Rissois are delectable Portuguese turnovers, which we Goans have received as legacy and have incorporated in our cuisine. These empanadas de viento are the perfect breakfast or afternoon snack with a hot cup of black coffee, I was informed. 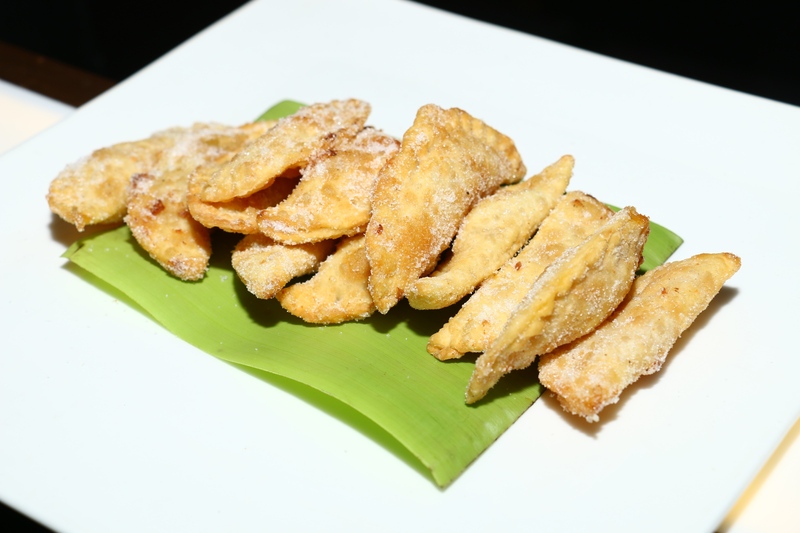 And the good ‘ol Goan Rissois can be savoured anytime too. The other dish we tried during lunch was exotic. Pescado encocado or fish with coconut sauce. One cannot go wrong with fish. Not at least where I am concerned. This Ecuadorian fish with coconut sauce, called pescado encocado, is a traditional coastal dish of fish seasoned with citrus and spices and then cooked in a sauce of cilantro, onions, tomatoes, bell peppers and coconut milk. As I tasted the flavoursome sauce, subtle yet, with a pronounced flavor, I was once again reminded of our Goan fish preparations with coconut milk. Gosh! The similarities were too many. Our caldeen is on these lines. And our basic Goan fish curry too. Of course we use prawns as well apart from fish. But so do the people of Ecuador. I was told that one should ideally use fresh coconut to make the sauce. Just as we Goans do. Both the coconut water and grated coconut flesh, but if you are in a rush, use canned coconut milk for convenience. Ah! The short cuts in modern rushed times, which we all resort to. Back in Ecuador, Pescado encocado is typically served with rice and fried ripe plantains. You can also serve it with patacones or green plantain chips instead of the sweet ripe ones. I was transported to heaven after my Ecuadorian meal of rice and Pescado encocado. You too must try it. It is really simple to prepare. Pescado encocado or fish with coconut sauce is an Ecuadorian coastal dish of fish seasoned with citrus and spices and then cooked in a sauce of cilantro, onions, tomatoes, bell peppers and coconut milk. Mix the lime juice, orange juice, crushed garlic, cumin, paprika, coriander powder and salt in a small bowl. Marinate the fish chunks for 1 – 2 hours. Heat the oil to prepare a refrito or base for the sauce, add the diced onions, tomatoes, bell peppers and salt, cook for about 5 minutes on medium heat. Add the coconut milk to the refrito, mix it in well and cook for about 10 minutes, if you prefer a thicker sauce you can thicken the sauce by adding ½ tsp of tapioca starch or corn starch. Add the fish fillets, cover partially and let simmer for about 20-25 minutes. Sprinkle with cilantro and serve with rice and fried ripe plantains.